This cat litter is the perfect way to care for your pet, without sacrificing the hygiene of your home. The litter works to trap odour and remove moisture, leaving the tray clean, fresh and dry. 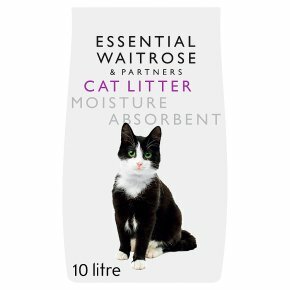 The bag contains 10litre and as part of the essential Waitrose range, it delivers excellent value as well as all the quality you'd expect. Provide a litter tray large enough for your cat to use comfortably. Pour in to a depth of 5cm. Inspect on a daily basis and use a scoop to remove solid waste. Shake tray to bring fresh granules to surface. Clean tray regularly with a mild detergent and ensure tray is fully dry before refilling.